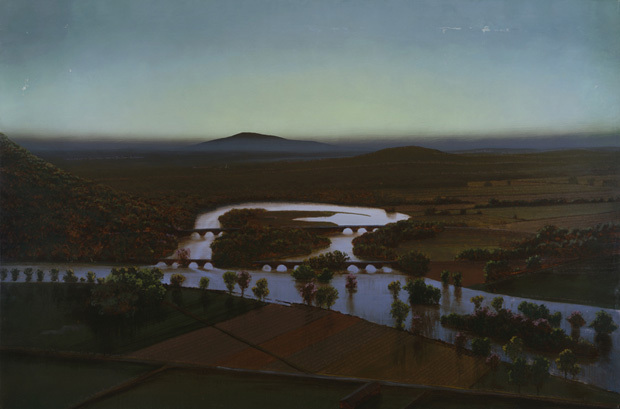 (CATSKILL, N.Y.) – Artist Stephen Hannock will offer a sneak preview of the upcoming exhibition River Crossings: Contemporary Art Comes Home — opening at Olana and the Thomas Cole National Historic Site on May 3 — as part of the Cole site’s Sunday Salon series on Sunday, April 12, 2015, at 2pm, at Temple Israel, next door to the Thomas Cole site. Hannock, who co-curated the exhibition – which features contemporary art installed directly into the historic spaces and landscapes of the two historic sites — will offer an insider’s look at how contemporary artists continue to be inspired by both 19th-century American landscape painters, and the landscape they celebrated. Called “the consummate landscape painter” and “a true American luminist,” Stephen Hannock, the co-curator of River Crossings: Contemporary Art Comes Home, began his artistic career near the site of Thomas Cole’s famous 1836 painting, the Oxbow. Cole and Frederic Church have been a reference point for Hannock, whose use of the canvas as a storytelling medium and virtuosic use of light make him an heir to the artists of the Hudson River School. 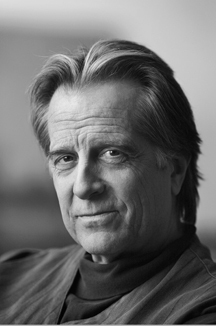 River Crossings will feature works by Chuck Close, Will Cotton, Gregory Crewdson, Lynn Davis, Jerry Gretzinger, Don Gummer, Duncan Hannah, Stephen Hannock, Valerie Hegarty, Angie Keefer with Kara Hamilton and Kianja Strobert, Charles LeDray, Maya Lin, Frank Moore, Elizabeth Murray, Rashaad Newsome, Thomas Nozkowski, Stephen Petegorsky, Martin Puryear, Cindy Sherman, Sienna Shields, Kiki Smith, Joel Sternfeld, Letha Wilson, and Elyn Zimmerman, in addition to selected works by Thomas Cole and Frederic Church from the permanent collections. Tickets to the Sunday Salon are $9 per person or $7 for members of either the Thomas Cole site or Olana, which includes wine and refreshments. The Thomas Cole National Historic Site has been presenting its annual Sunday Salon series for ten years, bringing today’s most creative thinkers to the home of Thomas Cole for lively conversations on topics relating to the Hudson River School of art. To begin its second decade, the 2015 schedule will focus on connections to the immediate present, in conjunction with the unprecedented exhibition of contemporary art, River Crossings: Contemporary Art Comes Home, that opens in May 2015 at both the Thomas Cole site and Olana.